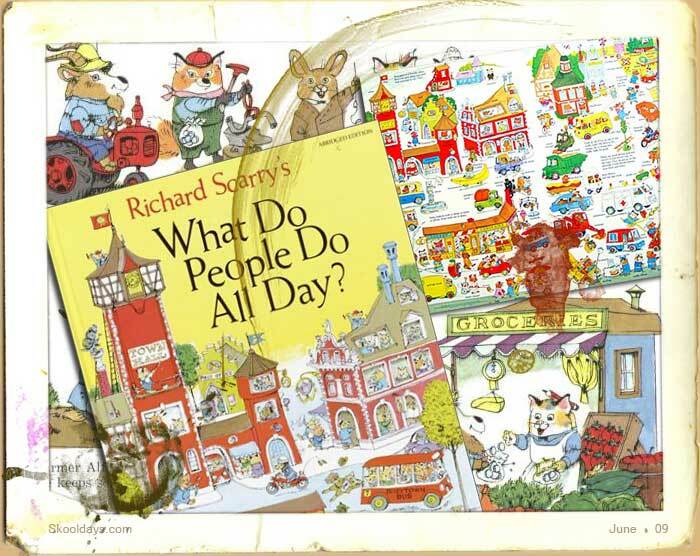 In 1968 a book entitled “What do People do All Day?” was released by Richard Scarry. This gem of a book has continued to be a massive seller. With incredibly detailed illustrations, kids would spend hours and hours on a journey of detail scanning and double scanning each page of illustrative detail. The book is about what people do all day. Since different people all do different things, the book covers a lot of topics. The first section looks at a standard Busy Town itself along the high street. The book cleverly shows scenes above ground, and below ground in intricate detail. We see the men digging tunnels and the underground pipes, street cleaners at work, and peeks into the bank and various shops as well as the fire department, doctor, dentist, and so on. Other sections of the book show what Mummy does all day at home, what the farmer does, the door to door salesman, the policeman, the fireman, the blacksmith, the postmen, the ferry workers, and so on. Of course over the years these things have changed and so the intricate detail of each drawing to has undergone revisions to align it with the latest thinking and political correctness. For many young ones this is a genius way of educating young ones for the first tine and on-going education. I’m sure many young kids remember learning there first understanding of certain trades and businesses from this great book “What do People do All Day?”. This entry was posted in Pop Culture, Toys and tagged 1960, 1970, 1980 by Skooldays. Bookmark the permalink. What's really sad is that the copies you can buy today have been abridged to 64 pages from the original 96. Apparently some of the stories have in themselves been deemed politically incorrect. How is a water filtration plant politically incorrect?